I introduce you to one my favorites- pandesal (also commonly spelled as pan de sal). Pandesal is the quintessential bread roll of the Philippines. Every country/cuisine/city has a nationally beloved bread. Think French croissants, San Francisco sourdough, and Italian focaccia. I introduce you to one my favorites- pandesal (also commonly spelled as pan de sal). Pandesal is the quintessential bread roll of the Philippines. 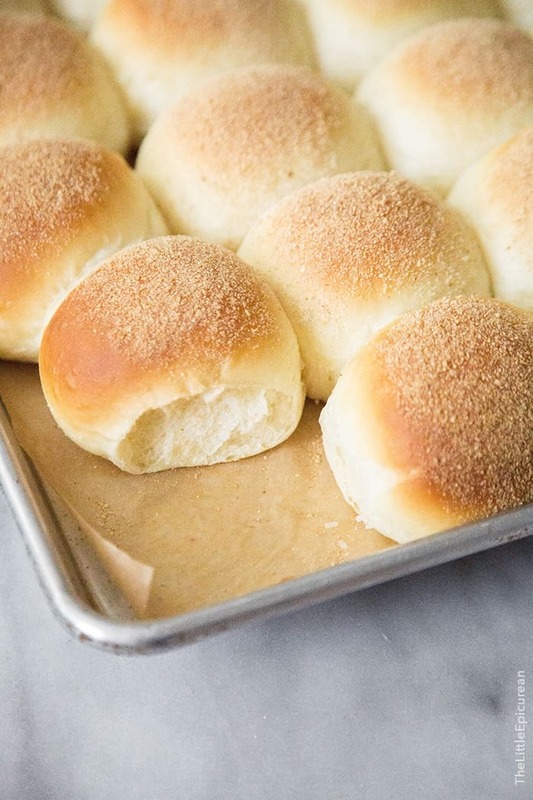 They look very similar to dinner rolls like Parker House rolls. However, the main different, being that pan de sal is pretty much served anytime of day except during dinner. It’s a classic breakfast or mid-snack. It’s a slightly sweet, soft and fluffy white bread roll that tastes amazing with salty cheese. I like it with gouda, edam, or smoked cheddar. It’s best served warm fresh from the oven. As a kid, I loved eating it with peanut butter. Sometimes when I’m feeling crazy, I’ll eat it with sweetened condensed milk and salted butter… and then I dip it in sweet coffee. It’s a delicious combo…no matter how weird it may sound. Trust. It’s delicious. It’s also wonderfully awesome with Filipino hot chocolate (tsokolate). They also make fabulous little ham and cheese sandwiches. They are kind of similar to Hawaiian sweet rolls in texture, except way less sweet in flavor. I think bread making is uber relaxing. Whenever I’m stressed out or mad, baking a batch of bread always seems to calm me down. Maybe it’s the learning to be patient part that does the trick? Or perhaps it’s the repetitive rolling of the bread? After the dough is divided into 24 pieces, each is rolled into a ball and dipped into bread crumbs. No, I think it’s the delicious and aromatic end result that calms my nerves. A kitchen filled with the scent of freshly baked bread is pretty hard to beat. In a large bowl, whisk together all-purpose flour, bread flour, and salt. Set aside. Pour yeast mixture into the bowl of a stand mixer fitted with a hook attachment. Add remaining sugar, butter, and lightly whisked eggs. With the mixer running on low speed, add the flour mixture in three additions. Once all the flour has been added, increase speed to medium. Continue to knead until dough comes together to form a smooth ball. Remove from mixing bowl and transfer to a lightly oiled bowl. Cover with plastic wrap and let dough rise at room temperature for 1 hour. Punch dough down and divide into 24 equal parts. Roll dough into balls and dip the top of the bread roll into breadcrumbs. 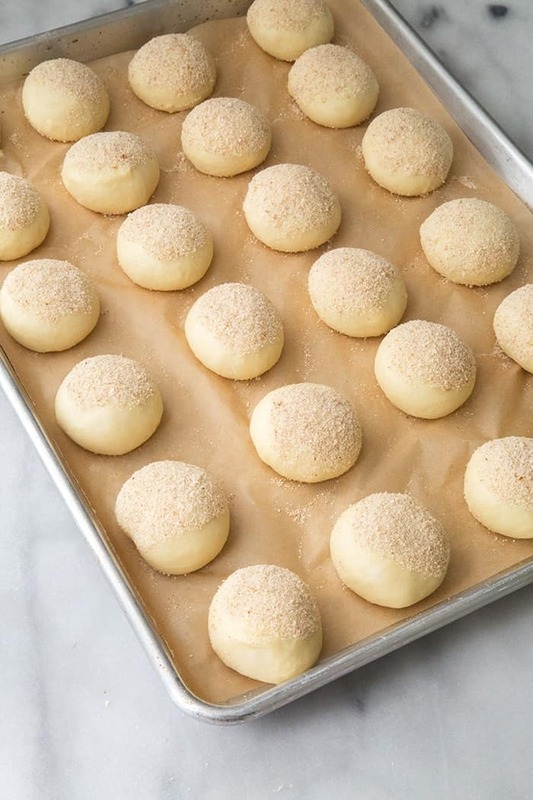 Place rolls breadcrumb side up on a parchment lined baking sheet. Cover dough with plastic wrap to prevent from drying out. Allow bread rolls to rise for 15-20 minutes, until bread rolls have puffed up. Preheat oven to 350 degrees F. Remove plastic wrap and bake for 20-25 minutes until fragrant and golden brown. Eat bread rolls warm or at room temperature. They look delicious! That golden brown could not be more perfect. Maryanne these rolls look so light and fluffy! I am always looking for new bread recipes to challenge my skills in the kitchen! I think I can definitely make these! These will be perfect for some game day sandwiches this football season! I’m totally making these this weekend to satisfy my Asian bread craving! 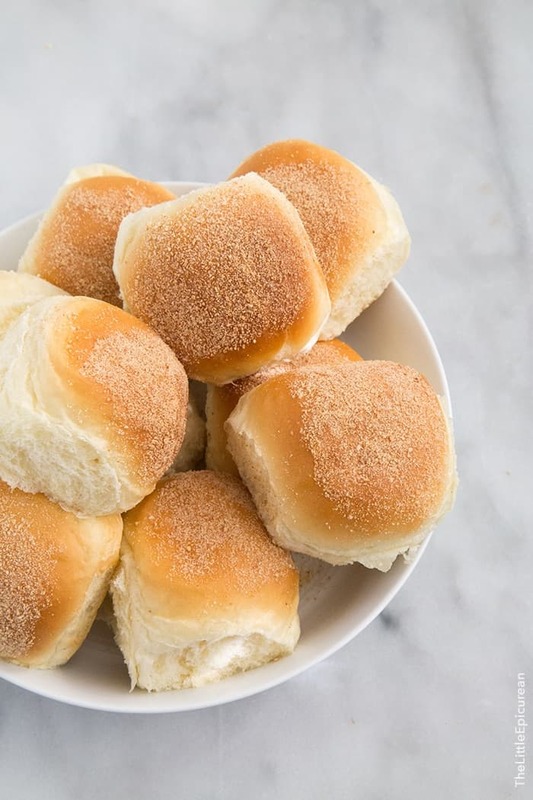 When I was growing up our local bakery was managed by lovely Filipino ladies, and I’m sure these are similar to the rolls that we used to buy from them all the time. I would have them in my lunch box with ham and butter and they were always my favourite lunch! Now I have those bakery secrets! Thank you! They look so yummy and fluffy. Do you think I can substitute whole wheat flour and get the same results? No, you’ll have to add more milk if you use whole wheat flour. I’m allergic to eggs. Can I omit it or what can I substitute? These looks yummy. I have tried to make pandesal at least 4 times this week alone. I have had trouble getting my dough to rise. However, I tried this recipe last night and finally…. I got my dough to rise. However….. When baking I found that the bottom of the buns cooked much faster and were browned before the tops were even close to being cooked. What are your recommendations? Place the rack higher? To ensure that your dough rises, make sure the yeast is active. The dough should feel slightly warm after mixing. Keep the dough at room temperature (about 72 degrees F) to rise. If the bottoms of the buns are cooking too fast, try double stacking your sheet tray. Also, use the middle rack when baking. Hope that helps. Yes, you can use instant yeast. However, you will have to decrease the amount of instant yeast by 25%. Hi, can this dough be frozen for baking later ? Hi Maya, no you cannot freeze this dough for later baking. Can i use breadman ( breadmaker) to mix the dough? Do you recommend to change the amount of yeast? Sorry, I don’t have any experience using breadmaker machines. Hi I’m just wondering because i tried this recipe. And after doing all the process and baking i just noticed my bread is so dense? And not as fluffy as I expected. I hope you can help me. Thanks! Hi Jade, sorry to hear that. Did you allow the bread to rest and rise before baking? Perhaps the yeast was not fully activated. It could also be dense because the dough was overworked. Maryanne these look amazing! I didn’t realise until you mentioned it that bread making IS theraputic.. Maybe its because I know I’m going to get my freshly baked carb fix once the baking part is done but whatever it is, it works! Can’t wait to try these rolls the next time I’m in the mood for some therapy! Your recipe looks very good, however I would like to see the amount of each ingredient in liters, grams and so on. Could you publish this here, please? Maraming salamat po! I’d like to thank you for sharing this awesome Pandesal Recipe!.. I’ve tried it and it was so good! ..my mom was very pleased and even said that its got the same taste of pandesal from her fave bakery way back from her hometown in the Philippines…again thank you much!!! Hi Maryanne , will try this pandesal recipe sometime . :D Btw , what’s the size of your sheet pan ? Thanks in advance ! Hi! I use a half sheet pan. It’s 13 x 18-inches. I tried the recipe and it was amazingly delish! Way better than the pandesal i buy near our house!!! Thanks so much for sharing this! I made these knina and it was a hit!!!! Salamat! I have been on a long quest for the THE pandesal. I think my quest ends here hehehehe… last few recipes i tried did not have the right softness and texture that i want… thank you!!! I did a variation though, 1 dozen i made was adobo stuffed pandesal and the rest were plain. Yum!!! my wife misses these very much and I am going to have a go. Is mixing with milk essential can water be used? I don’t have a bread mixer machine and I read you can over work the dough. How long should I knead it by hand? Also like another person commented; here in the UK we use grammes, litres and Centigrade degrees. I guess I just need to convert to the nearest english equivalent. If it works out I will let you know. If you want to make the dough ahead of time, I suggest putting in the fridge covered overnight. Bring it back to room temperature before baking. DO NOT leave it out overnight at room temperature because it will continue to proof and rise. The dough will taste very yeasty if you let it rise too much. Girl your pandesal recipe is on point!!! 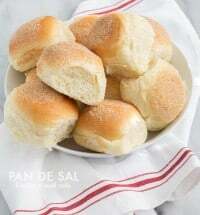 This became my go to recipe for pandesal! Though this version is the on the sosyal side because of the butter, milk and egg component compared to just flour, oil, yeast, sugar, water and salt version. This recipe is moist and fluffy even if it gets cold! I’m a huge fan now! Hi! I have a quick question. After combining all the ingredients, my dough seems to be too liquidy/wet and won’t form into any proper shape. Is it supposed to be that way? Or should I add more flour? Hi! I only have salted butter on hand. Can I use this instead of the unsalted and just don’t add anymore salt? Yes, you can used the salted butter. Instead of adding 1 1/2 tsp salt, just add 1/4 tsp. Hi can use the baking powder intsead of yeast? I couldn’t find yeast here in norway. No, you can not substitute baking powder for yeast. Yeast is widely available for purchase online. What should I do my oven can inly heat up maximum to. 300 C? Hello! First time trying this recipe and it is an immense success! Followed the recipe to the tee and it resulted in a fluffy, light, perfectly sweet roll. My parents have been wanting pan de sal ever since we left the Philippines and they really really love how this turned out. This is going to one of my more frequently used recipes. Thank you for sharing this! And to sandy from Jan 13, this recipe is not in the metric system. I don’t know how your rolls turned out, but i hope that neither your oven nor your dignity were damaged. 350 degrees Fahrenheit is equal to approximately 177 degrees Celcius. It would be nice to see the recipe quantities in ounces . Can’t get my head round cups. Hi! I wanna try the recipe but i have a question? Whats the alternative of bread flour? High protein flour (at least 13% protein) would be be a good substitute. I just made your recipe and followed exactly what you posted and I guess I owe you a lot! You will make me a millionnaire soon by selling these gems! I have tried many recipes of Pandesal and thought I have perfected it already but when I bumped into your post, not only did the picture of your Pandesal stroke me and lured me to give it a go- and that was the best thing I´ve ever done! A million thanks to you. I wish I could post some of the pictures here. Thank you so much for your message. I am so glad you like the recipe! It’s definitely one of my favorites and I make it often! Hello there Maryanne! 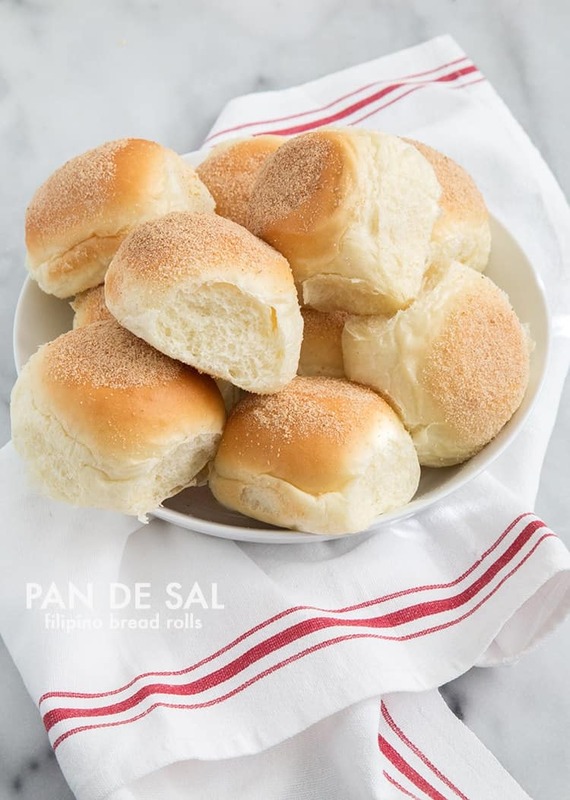 Ive been searching pandesal recipes looks like i finally hit the jackpot with this one. im from the philippines and i dont know where i can get those powdereed bread crumbs u rolled on top of the dough? what e have here in the local stores are like the one u used for shrimp or chicken tempura to make it crispier. where do u think can i find the breadcrumbs that u used? and also can i double or multiply the recipe to yield more pcs i have a big family and having 24 pcs just aint enough for merienda :D thank you! Mine didn’t come out right! When I was kneading the dough, it kept falling apart and I was using my kitchen aid. It rised, so I thought it was going to turn out good. The outside was hard before it even turned golden brown. The taste isn’t anything like pandesal. What am I doing wrong?? I followed the recipe exactly. I’m sorry to hear that. I’ve tested this recipe several times before sharing it and I’ve made this recipe over a dozen times with consistent results. The recipe lists all-purpose flour and bread flour. I use the brand King Arthur Flour. My house smells like panaderia de manila! 24 pieces gone in 30 seconds. Thank you for the wonderful recipe. Hi. I cannot find a plain bread flour here in my area but there is bread flour mix, can i use it? If not, can i just use all purpose? Is there a difference? Bread flour mix is not the same as bread flour. Bread flour has a higher protein content than all-purpose flour. Thanks for trying out the recipe! I’m so glad you liked it! Hi Mary Anne this is a very good Pandesal recipe of all I tried. A+++ for you sweet heart. We love it. Thanks iha for sharing you’re lovEly to take time out to share this pandesal. It’s yummy and light and no words I can describe it just like home. Thanks a lot. No. Self rising flour contains baking powder and salt. Can i omit bread flour from the engredients? No, the bread flour is necessary. You can substitute regular all-purpose flour, but the final texture of the bread will be slightly different. I tried the recipe and it was amazing. Thank you so much for sharing this! I will definitely do it again. I followed the directions, except that I did not use dry yeast. I can only find instant yeast. I mixed all the dry ingredients and followed the rest based on the procedure listed. It turned out similar to the pandesal I grew up with. That’s great to hear! Thanks for trying out the recipe! Maryanne…. this is delicious but mine came out heavey although it’s soft. Also, if i wanted the bread ficers to be more stretchy what should i do? The heaviness of the bread could be due to overmixing and not allowing the dough enough time to rest. I suggest allowing the dough to rest a little longer before baking. Added another half a sachet of the yeast to make it a little fluffier… :) love your recipe! 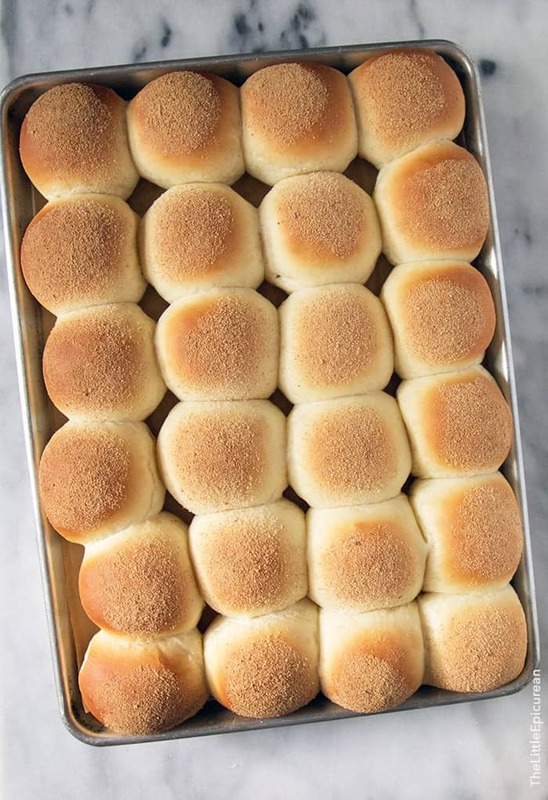 My husband is from the Philippines and I made him these rolls. He was very happy and took some with him this morning for his snack between hospital rounds and patients. Excellent recipe. I have tried others but this one is the best. Good tip about what to do about the bottoms cooking faster than the tops too. Thank you. I loveD making these. It brought back happy memories of his childhood in the Philippines. That’s so wonderful to hear! I’m so glad it brought your husband happy memories! Thank you for trying out the recipe! No, this requires the use of an oven. The bread will no brown in a steamer. I tried many pandesal recipe and it’s all flop. The problem usually it soft when freshly bake and hard a day after. I hope the recipe works well for you! I’ve been making pandesal for 3 times now using a slight difference in the ingredients and totally different procedure like yours. But I wanted to try yours. I made this recipe 3 days ago, I thought It wouldnt come out good as my dough was very sticky that I have to add another 1/2 cup of flour. Maybe because of humidity as I live in the Middle East. But was happy with the result. The pandesal was soft and still soft on the 2nd day. But I baked it for only 15minutes as I dont want a brown bread. I just like it white. Thanks for the recipe. The flavor of this recipe is on point but I’m afraid I’m a new baker and it’s my first try of making bread, I made this recipe yesterday but I feel that I’ve done something wrong, the taste was good albeit abit floury and the pan de sal were a bit dense, I am not sure about my kneading techniquethough, for how long am I suppose to let my KA (hook attachment) knead my dough?Can you give me some approximation in minutes so I have an idea? It was sticking on the sides of the bowl after quite some time and I am not getting that smooth ball so I added flour, which helped then I kneaded the dough by hand?Will it eventually pull clean of the sides and form a smooth ball had I not interfered? any suggestions please? Thank you. Hi. Can I add chia seeds in this recipe? If so do I add them while kneading it or after kneading and shaping the dough? Thank you. If you do not have a KA, I’m assuming you would knead by hand? If so, for how long and what do you look for to know it is ready? Thanks! MaryAnne, your pandesal recipe is beyond great tasting pandesal I would want to have. It is easy and can easily be made. Thank you to you and more power in the food business. I’m sorry to hear that the recipe didn’t work for you. What kind of baking sheet did you use? Darker metal sheets will absorb more heat than lighter colored baking sheets. That may have caused the bottom of the bread to cook a lot faster. Was your oven set to convection (circulated air) or conventional setting? That may also affect the temperature of the oven. 1) Is the bun supposed to be crusty on the top? Mine turned out crusty on the outside and a little on the dense-side for the interior. I’m thinking I should have left it rise a bit more. I did 1 hour first and then 15 minutes before I baked it. 2) When it came out of the oven, it smelt kind of floral-ly rather than like pan de sal. Also, the buns were smaller and most didn’t quite touch each other. Any idea why? 3) When I added the active dry yeast to the warmed milk, it didn’t quite dissolve. It did become foamy on top after 10 minutes of sitting though. Is dissolving the yeast imperative? I LOVE pan de sal and would like to try the recipe again, but hoping you can help me out with the above. 1.) No, the bread is not supposed to be crusty on top. Make sure the dough is covered with plastic wrap after rolling. When the dough is exposed to too much air, it will form an undesirable dry crust. Resting time may vary depending on the temperature and humidity of your kitchen. 2.) I’m not sure why the bread smells like that. 3.) Yes, you should dissolve the yeast in the warm milk. Make sure the yeast is not expired. Old yeast or dead yeast could result in dense bread that does not rise. I made these for my wife today and her sisters were really impressed by the result! Thank you so much for sharing this recipe. I have been craving pandesal for years. I tried your recipe but made a snafu. I forgot to add sugar and I had already started kneading when I realized it. I folded in the sugar and continued kneading, crossing my fingers and hoping I saved it. Well the baked pandesal tasted good but could use a little bit more sugar. But the biggest thing for me is that the inside is too doughy for my liking. I like it light and soft and almost “airy”. How do I achieve that? Thank you in advance. I would appreciate any baking tip. FYI, it was my first time baking breads. Thank you for trying out the recipe. The addition of the sugar is important. When the sugar is initially mixed with the yeast, it helps to jump start up the activation of the yeast. The second addition of the sugar helps to continually feed the yeast and ensure proper dough proofing. The “proofing” of the dough is responsible for the texture of the finished bread. If mixed properly, the bread should be soft and fluffy on the inside. Great recipe. Works every time. Consistently great results. I found that I can skip the bread flour by adding one tbsp of gluten powder to the mix. Hello! This recipe is exactly what I need right now, but I’m someplace where they don’t sell measuring cups (gasp!). I do, however, have a kitchen scale. Is there any chance you can put the gram equivalent in the recipe as well? I tried converting but it didn’t turn out well. Cheers! Hi mam! Pwede ko po ba substitute cake flour? Hi Mary Anne, I am only cooking for 2. Would it turn out the same if I divide all ingredients in half? Hi Cecil, I would suggest making the recipe as it. 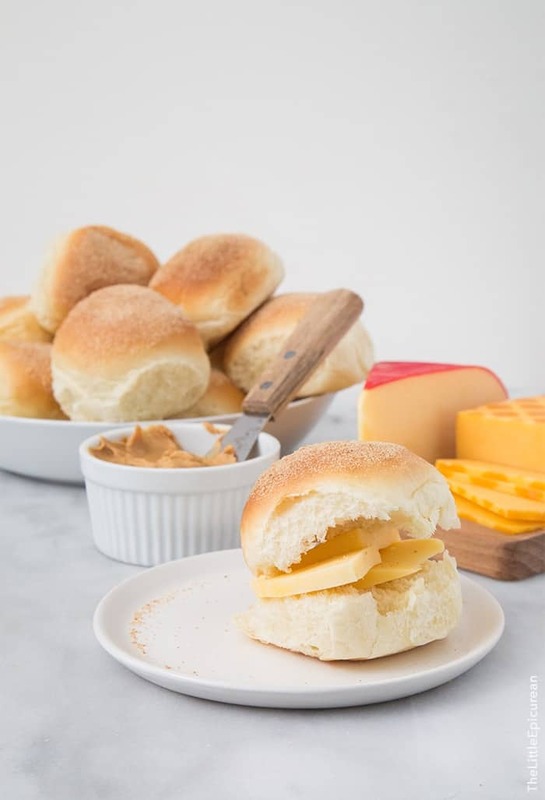 Eat half of the rolls and keep the others stored in the freezer. I made these last night but it turned out so dense and slightly hard! I live overseas and it gets cold here, currently at 12 degrees. Do you think it had something to do with the temperature? How old is the yeast you used? Most importantly, temperature can greatly affect yeast. If it’s too cold or too hot, it will be not activate properly. finally found the perfect recipe for pan de sal, tried other recipe and this is the best. Hello, i used vegetable shortening instead of butter and lahat all purpose flour lang since we dont have bread flour. Will it make a bug difference po kaya? Hopefully i will have good results, can’t wait. Thank you for sharing! Overkneading will result with dense, tough bread. You mention that the rolls were “moist in the middle”- do you mean that it wasn’t cooked inside? If so, try rotating the baking sheet 2-3 times during baking to ensure even cooking. Sometimes one side of the oven emits more heat (hot spots). Thank Maryanne! I plan to try again until I get it right. Yes, the center was moist or spongy and the rolls became hard after cooling. I tested the rolls at 22, 24, 25 and 26mins(dark brown) in the oven. Thanks again. Can I use all purpose flour for pandesal instead of adding bread flour..? Thx! Yes, it okay to substitute APF. However, the texture will be slightly difference because bread flour has more protein than all-purpose flour. Hello, Thank You so much for the recipe. I can’t wait to try it. I do have 2 questions..
How long do you usually have to mix the dough in your stand mixer? Do I need to flatten the bread balls before they cook? I have read some recipes that say it will rise as it cooks… Or should I leave them as little ball shapes and cook them that way? can i use high protein flour? I use a combination of all-purpose flour (about 10% protein) and bread flour (about 12-14% protein). If you only use protein flour, the resulting bread will not be as soft and fluffy. thank you for the recipe. i try them out and they are very delicious. I must say this is the best one for me! Been trying different recipes including friends treasured ones! But nothing satisfies me! And I was looking for a recipe again and I based my decision on the photos when I googled it. And you know your recipe photo was enticing to me. And guess what out of the oven what I did looks exactly like yours and the taste…wow! Jackpot! Thank you. Will be visiting you online again and again! If you are using instant dry yeast, no need to active the yeast in step 1. Add the instant dry yeast with the other dry ingredients in step 2. Add the milk in step 3. Follow remaining directions as is. What kind of breadcrumbs are best? I came across your website searching for Pandesal recipe.I followed your recipe but i stuff some meat on it and Voila!! !They were so good and the bread was fluffy!Thank you very much! That’s wonderful! Glad you enjoyed it! Hello ms maryanne can i subtitute the butter into shortening or margarine? using shortening for this recipe. Thank you for trying out the recipe! Glad you liked it! Can i use pastry flour instead of bread flour? Thanks. No, pastry flour has a protein content of 9%. Bread flour as protein content of 14-16%. I have tried your Pandesal recipe and they turned out so beautiful and d yummy.. Thank you for trying out the recipe! Glad you enjoyed them! Just found this recipe online. Made them and they were perfect! Crusty on the outside and fluffy on the inside. Followed the recipe exactly as written. Thank you. That’s wonderful to hear! Thank you for trying out the recipe! Is it ok to use salted butter?